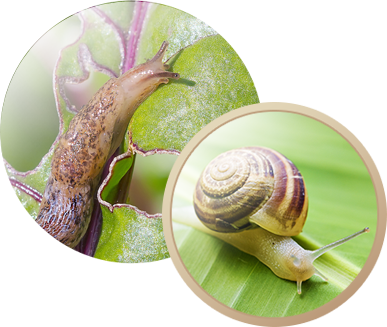 Probably the best description of a slug is that it is a snail without a shell. They vary in size depending upon the species and measure from 1/4 to seven inches long. They secrete a characteristic slime (mucus) which they leave behind as they move around. These slime trails are silvery in appearance upon drying and is a common diagnostic character used to identify the presence of slugs. The color of slugs also varies with species, ranging from a dark black-brown to an orange color. When an actual slug is found their soft slimy bodies and extensible eye stalks give the creature its characteristic appearance.